There are many ways here at C L Promotions for you to help to promote your business details and company logo. Just choose which designs you prefer and we'll see that they get printed with your company details to ensure that you stay advertised at all times. 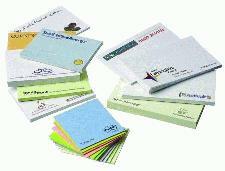 Promote your details on our Customised Post- it notes today.